Health system marketers are discovering that email is the best way to interact with physicians. Whether your goal is increased referrals, reduced out-migration, or a stronger health system community, targeted email lets you maintain frequent communication with relevant doctors. But a successful email campaign requires a high-quality list, and email lists aren’t created equal. 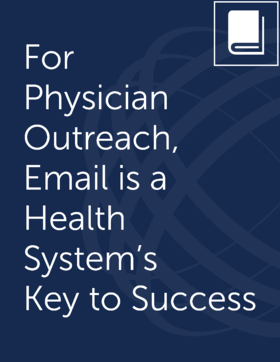 Our recent e-book, For Physician Outreach, Email Is A Health System’s Key To Success, helps you recognize quality when you see it. Physicians prefer email, and an authenticated database guarantees that your messages will reach them. Download the ebook today to understand why the right email provider makes all the difference.